My research topics encompass different concepts such as eco-physiology, evolutionary biology, population dynamics, immuno-ecology, reproductive biology and behavioural ecology. My multidisciplinary research allows me to respond to various issues raised in the physiology of conservation. Understanding and predicting the impact of climate change on biodiversity is a real scientific challenge and a major economic as well as societal one. 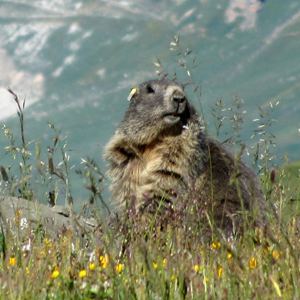 The scientific objective of our project is to develop an integrated and mechanistic approach to understanding the causes and consequences of climate change surrounding the alpine marmot. This project is innovative and unique because it is one of the first studies to combine physiological, demographic and evolutionary mechanisms and integrate them into a mathematical model to predict the state of alpine ecosystems in 20-30 years’ time, and so guide the current management methods to achieve desirable objectives.